We all think our dear children are pretty fabulous, but if you’re confident that your little tyke is destined for greatness, perhaps you should consider this ambitious moniker for your son. Thanks to Natalie for suggesting Today’s Name of the Day: Magnus. Magnificent. Magnate. The Latin magnus means great, and may have become a personal name through a misunderstanding. The story goes that Magnus I of Norway was casting about for an appropriately royal moniker. Since it was 1035, Charlemagne’s reign was much in mind – and the Latinization of his name, Carolus Magnus, or Charles the Great, would inspire the new king. 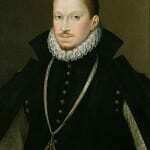 He, in turn, would be the first of seven Norwegian and three Swedish kings, plus a host of Northern European nobles. Before the royals, the name was worn by at least two saints: Saint Magnus of Avignon and Saint Magnus of Füssen. It seems unlikely that either was born by the name, however, and it’s probable they were not widely known in Scandinavia circa 1000. And so despite his Latin pedigree and saintly bearers, Magnus reads as a decidedly Scandinavian choice. A host of accomplished Swedish athletes have worn the name, including Magnus Samuelsson, the former holder of the World’s Strongest Man title. While it’s not in the Swedish Top 100, it ranked #3 in both Norway and Denmark last year. The name is also used sparingly in Scotland and Germany, and appears regularly as a surname, along with Magnuson, Magnusson and Magnussen. In English, we think that the name is so very strong and aggressively masculine that it almost turns the corner and sounds neutral again. Perhaps we’re influenced by comedian Will Ferrell’s choice of Magnus for his firstborn – it takes some of the edge off the name. (Ferrell’s wife, Viveca Paulin, is Swedish.) Magnus peeked into the US Top 1000 back in the nineteenth century, but has been seldom heard on our shores. If Magnus feels like too much for your son, there’s always the handy nickname Gus. And in the 2005 Will Smith flick Hitch, a male Magnus even went by Maggie. In physics, the Magnus Effect describes the spin on a ball in a sporting event – think golf balls and tennis balls. It’s named after German scientist Heinrich Magnus. We’ve met one Magnus, younger brother to Gunnar. It’s a lot of name, and could be burdensome if your boy turns out more bookworm than basketball star. But with many parents choosing rough’n’tumble names for their boys, we can’t help feel that Magnus is a cut above modern monikers like Slade, Blade and Jett. We think Magnus has plenty of history and sounds both imposing and sophisticated – maybe too much so. I live in Denmark, and here the name Magnus is pronounced ‘Mownus’, as the letter ‘g’ in Danish is usually soft/silent. It’s a very popular name here too! We were going back and forth between Severin, August and Magnus. After an emergency c-section he came out kicking, screaming and completely not a Severin or August, so Magnus it was and Magnus he is. My husband ad I named our son Magnus James and it fits him perfectly! I LOVE the name Magnus! So strong, sophisticated and (to us) intellectual! I’ve got Scandinavian relatives that spell is Magnes instead of Magnus. I’ve also heard of Magnus being shortened to “Mags”. Magnus is a nice name, but I feel it is kind of a big name for a child to live up to. It’s cute and classy, I just probably wouldn’t use it. I have nothing against it though. I love Will Ferrell and I really love his 2nd son’s name Mattias too. Magnus and Mattias make good sibling names, even though I usually hate siblings having names that start with the same letter. I don’t think Magnus fits with my surname either, but I do like it. I love his history, strength, warmth and charm. What’s not to love? Of course, he sounds fairly ridiculous with my surname (never mind the alliteration, I dislike alliteration) so he’s not for me *sigh*. I would love to meet a handful of them! Magnus is awesome!